Ariah is about to start training for his magical gifts under the mentor chosen for him, Dirva. However both Ariah and Dirva are hiding important aspects of their gifts and their personal lives that will throw conflict and questions their way. As Ariah's relationship with Dirva's brother, Socha, blossoms into an unexpected romance, and his interaction with Shayat, female caravan leader, intertwines with his, his life seems to be falling into place. But the empire is acquiring more territory and is conscripting elves with Ariah's gifts. Through the twists and turns of Ariah's life, his journey from boy to man, and from land to land will teach him how far he will go in order to sacrifice himself for those he loves. This is very much an 'ideas' fantasy and deep character exploration via the medium of fantasy, so if you go into it expecting typical sword and sorcery or epic or any other fantasy sub species, then you're probably going to experience a disconnect. I really enjoyed it. The voice is beautiful. The world building is exquisite. The characterization is very carefully drawn and developed. It is not a light read. It is not fantasy for entertainment alone's sake but it is an unusual and brilliantly well written fantasy. It is easy to identify with Ariah as he goes from effectively a late adolescent to a grown man in the passage of the book. Those same instances of questioning and dislocation, of a sense of alienation and then finally becoming comfortable in one's own skin and, more importantly, with the fact that you will not ever have all the answers and that's ok.
Saunders cleverly draws on her well imagined and built cultures to explore issues of pairing, what it means and whether it stretches to incorporate more than a pair. I found all of the ideas fascinating - despite the tendency of the prose towards a density that many might find off putting. 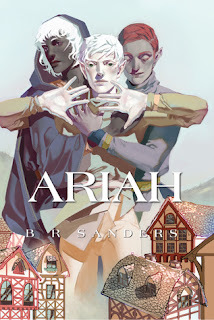 I enjoyed the journey that Ariah takes the reader on. Others might argue that not much happens here but while the conflict is almost entirely internal or at least very subtle (human vs elf, silver vs red, empire vs other cultures) there is plenty going on. I suppose where I came unstuck were several moments of severe irritation with the characters. Dirva's harsh reaction to Ariah's initial outburst in a The City especially annoyed me. I realise that this is partly me - the position of mentor is a sacred one as far as I'm concerned so I felt that Dirva, superior in years and experiences, should have demonstrated the tolerance he expected Ariah to emulate. Let's be honest the lad was barely out of the school room, Dirva neglects his training and then is willing to strand him in a foreign land because Ariah, after a severe fright, parrots opinions he has never had to confront before and probably took in with breast milk. Instances like that annoyed me. I occasionally found Ariah's decisions to be completely inexplicable too. Rage against the machine all you want but don't endanger others over it maybe? Anyway, more me than the book I fear. Overall this was not a light easy read but it was a very rewarding and enjoyable one. Very much a meditation on the rights of every person to make their own choices and have them respected. Loved it.